Banking, along with all its other advantages in society, has the great fortune of a system that is a confusing concept to most people. It has never been part of a curriculum in any elementary or secondary school that I’ve or anyone I’ve known studied. Even people working in the banking or loan industries sometimes have little knowledge of how the whole clunky mess operates from end to end. After some minor research into the banking system in an attempt to better understand the real nature of the ever nebulous magic wand of Monetary Policy, I realized that this was an unnecessary and very dangerous ignorance. The concept is really just not that difficult to understand, even for us common ignorant folk. Understanding the commodity of exchange, in our case US Dollars, is an essential part of being a free, self governing people. Murray Rothbard’s book, The Mystery of Banking breaks the whole system down in layman’s terms within 320 large print pages. It’s an excellent jumping off point for understanding what exactly money and our version of it actually are. It also gives a great rundown on the central bank’s main tools for Monetary Policy, a completely foreign yet crucial concept to most citizens. There are many other great places to further research this, but I’d recommend Rothbard as your initial guide. For our busier readers, here is a very rough, pedestrian version of how your money, your central bank (The Federal Reserve), and the union of them both work. This will assume that the reader has some knowledge of the law of supply and demand. (Also nicely covered by some easy reading in Rothbard’s book). Money is the exchange commodity. This means it’s the commodity that the market place recognizes as worth a transferable amount for other commodities. It is important to understand that money itself is an actual commodity too. As a quick refresher on the concept, in micro economics you learned about the supply vs. demand of the commodity of, say, oranges. Where the supply and demand curves meet is the recognized market price. Below is a rough graph showing this. Money as a commodity is sometimes taken for granted because commodities are measured in money. But just like our orange example, money has a supply and demand curve too. Its valuation also results from the law of supply and demand. Its measure is recorded in purchasing power. 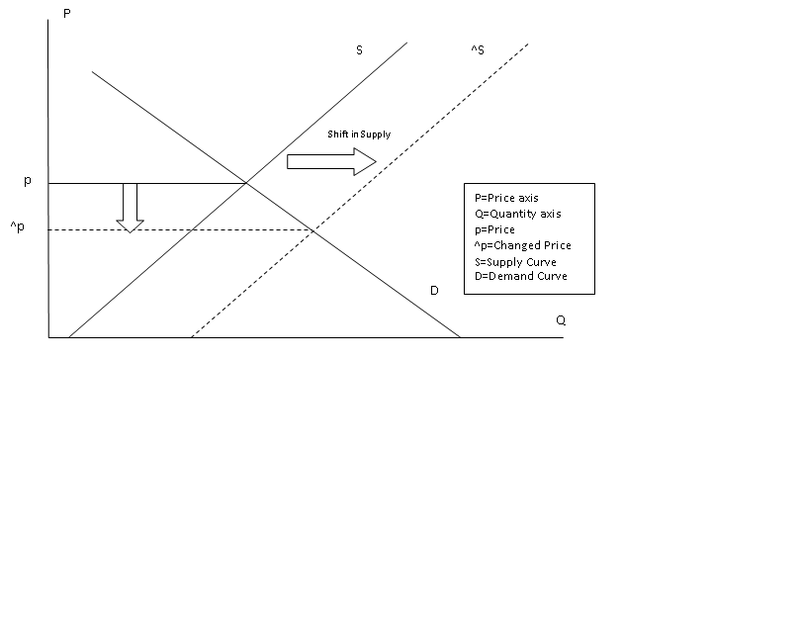 Just like if the orange supply increases the optimal market price of the oranges will decrease, an increase in the money supply too will decrease the optimal purchasing power of money (see rough chart below, these rules apply to both oranges and money). This is an important concept because this is the string that a central bank holds; the supply of money. Money has a long history. Man bartered goods for goods in early societies. This was infeasible because if 1 and ¾ houses were worth an ox, it was impossible to divide the house commodity accurately to pay for the ox. Out of this the concept of an easily transferable worth the exchange commodity was born. The idea of an exchange commodity satisfied the market need for a more precisely divisible and widely acceptable means of payment. The selection of an exchange commodity happens overtime. Once something takes on the characteristics of money, its acceptance begins to grow. If the major chicken breeders are accepting rice in payment for their livestock, Chicken merchants start storing rice to buy their chickens. They also start accepting payment from customers for chickens in rice to buy more inventory. Eventually, rice will have gained acceptance as worth and the marker for the buying and selling of all other commodities. This has happened throughout history, but the exchange commodity amongst the civilized world almost always evolved into gold. Gold has the key characteristics of an exchange commodity; it is a limited resource, it is precisely divisible, it gained a widely accepted inherent worth for most civilized people throughout history, and it was durable. Gold, however, became difficult to carry and secure in more modern times. So overtime, money warehouses that offered you the service of storing and protecting your gold began to spring up. They offered a solution of holding your gold deposits for you with receipts (bank notes) that certified that it was yours and was redeemable anytime. That gave people the ease of holding paper instead of clunky metal. The market, knowing your paper was worth gold, accepted it as a means of exchange. In essence, money was now paper. The acceptance of paper as money lead to some consequences in this money warehousing, or banking industry. As the industry grew, and money became a paper promise, the banks began risking their customer’s gold reserves as collateral for loans to others, something the customer never really signed off on. This, however, became fully legal and became even more ethically questionable as the banks could loan even more than the gold in their vaults. For a while banks were cautious to do this because if their loans and investments didn’t pay off, their gold would be wiped out. A natural regulation in addition to bank runs (when customers all want their gold back because they think your operations are compromising their savings) that presumably kept a bank honest. Bank runs and overleveraging (essentially banks lending out more than they can pay) however, do cause significant ripples in an economic system. This scared people into creating artificial regulations and guarantees (FDIC) on the money that lessened a bank’s liability to the consequences of inflationary banking. Ultimately, the fear led some to believe that a central bank was the answer to controlling the wild beast. Enter the Federal Reserve. The central banking issue was a hot debate since the inception of the US government. There have been manifestations of a central bank throughout its history, like the First and Second Banks of the US, but the debate has mostly ended since 1913 with the creation of the Federal Reserve. (or maybe more accurately since the 1940s with the widespread adoption of Keynesian economics) The Federal Reserve is an oft spoke of, but little understood piece of our economy that warrants further understanding. Thanks to what sounded like crazy talk to most people, Ron Paul has brought back the debate about this little-understood institution. Sure chanting End the Fed is a lot of fun, but it is also important to understand why this might be a good idea. The Federal Reserve’s power and influence in our lives is absolutely huge. They basically control the supply of money at the hands of large banks and government agendas. How do they do this? Through the Keynesian toolkit of Monetary Policy. All bank notes are now Federal Reserve notes (aka US dollars). The Federal Reserve used to hold gold and silver in backing its notes, but has done away with that “antiquated” concept since 1971. Now your bank note is a receipt for faith that it is, itself, worth something; a concept known as fiat currency (faith based money). This gives the Federal Reserve a blank slate on the amount of money it allows into economy. Monetary Policy consists mostly of three main tools, Interest Rates, reserve ratio requirements and Open Market Operations. These sound like fancy terms, but again, are not very complicated. These are hailed as innovative tools to combat market volatility but such powerful control of market forces has very real consequences; namely market distortions and erosion of the money’s value (inflation). ount banks are allowed to lend vs. what they actually have. Today that ratio is 1/5. What that means is the Fed tells banks that although they may only have $1M, it can loan $5M. This creates a phenomenon where more money than actually exists enters the system, at least accounting wise. This is what economists call the money multiplier. It obviously creates some logical issues as to how everyone could claim their money. As a tool to multiply money throughout the system, the Fed could decrease the ratio allowing banks the ability to put out even more fake money it doesn’t have. Last but not least there is Open Market Operations. Open Market Operations is the term for the Fed’s ability to change the money supply by buying or selling items from the market. The version of this you have mostly heard of in the past few years is the buying side called quantitative easing-The nuclear bomb of monetary policy. Quantitative easing is basically the Federal Reserve’s printing press. Although it’s not as easy as them running a paper printing machine, it’s not really that much more complex. Quantitative easing is purchasing goods from the economy with money that did not previously exist. The Fed buys these goods with newly created money that enters the system and increases the total dollars in the economic pool. This new money increases the total money supply, not only by the amount itself, but also by the money multiplier previously described. The goods the Fed purchases are US Bonds from large investment banks. These banks through loans and other operations eventually filter this money through the rest of the system and it enters general circulation. Open Market Operations are also another means for manipulating interest rates. The theory at the most basic level is that if the total money supply increases the cost at which banks might sell you that money, interest rates, will go down. You may ask yourself, if the Fed can do all of these things to get more money into the hands of people, why is this so bad? A brief look back to the important point of money as an exchange commodity is necessary. Money, remember, is not independent of the laws of supply and demand. When its supply increases, its value (purchasing power) decreases. So although there is now $2 for every $1 there was, what used to buy a dollar’s worth of goods now only buys half that amount. You have to spend the $2 to get what a dollar used to buy you. Essentially no real new wealth is accumulated by most and their current wealth buys less. These rules do not apply fairly to everyone. Assets increase in value in relation to the dollar so holders of assets (usually the wealthy) benefit from a declining dollar. The first recipients of this new money also have the unfair advantage of using its worth before the inflationary effects take hold. The common citizen, working a salaried or hourly job still makes the same amount, and his dollar savings are worth less. People are forced to risk their savings in stocks and bonds to try to keep up with inflation. The Federal Reserve’s tools, particularly Quantitative Easing, also lend the Federal Government the alarming ability to spend endlessly. Buying government debt indirectly like the Fed does through Quantitative Easing ensures a market for US Debt which allows deficit spending to go on exponentially. Endless wars, insolvent social programs, failing bureaucracies, corporate bailouts, can operate in perpetuity. The resulting inflation from an ever increasing money supply gives the Federal Government an even larger credit balance since the adjusted amount of the loaned money is worth less in time. For example, if the Treasury debt today is $14 trillion (which it is by the way), it will only be measured as worth maybe $10 Trillion over time in real dollars. Inflation is good for government obligations, less beneficial to your nest egg. A central bank’s goal to optimally control the money supply is a noble one, but unfortunately a dangerous one. Its policies create artificial market signals and cause mal investment in the market place. This creates bubbles and busts that have come to be seen as naturally occurring economic forces. It causes the deterioration of money’s worth which makes a common man poorer. It is a massive wealth shifter to the already wealthy, a fact that even central bank apologists concede. This price inflation too has become an accepted scientific fact rather than an understood topic. Most people understand that money loses value over time but never learn why money has a time value. You don’t need an economics class to teach you this concept, it is common knowledge to most that $100 in 1980 was worth a lot more than it is today-over 2.5 times better at around $261 by modest estimates. Most think of inflation as a naturally occurring effect of time, but time itself doesn’t control the purchasing power of a currency. In a fiat based system man decides this. Our exchange commodity has essentially been hijacked by a monopoly bank that is subject to the same political and special interest pressures as elected officials. I personally am more scared of power elite than I am of a shiny metal. Perhaps if more people understood the concept, they would be too.